Browse our daily menu, which always has many healthy and satisfying choices. 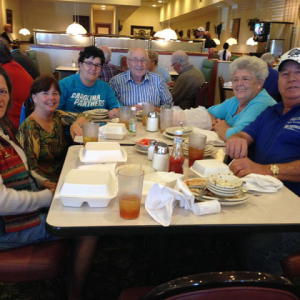 Both locations serve lunch and dinner and Kernersville serves breakfast on weekends. We make dishes that keep customers coming back. Read the mouth-watering descriptions of some of our homemade specialties. Let us do the cooking. You can order delicious takeout for your family or catering for a large event. If you don’t think that healthy fast food is possible, visit C&H Cafeteria with restaurant locations in Kernersville and Durham, NC for scratch made food that is nutritious, convenient and affordable. Our goal is to provide the community with a friendly, casual dining experience and serve our customers homemade, wholesome foods prepared daily by our trained staff. You will leave our restaurant feeling good. We offer dine-in, takeout and catering at both locations. The Original Fast Food. Only Healthier. Our wide selection of recipes allows us to change our menu of homemade salads, entrees, vegetables, breads and desserts frequently. We use only the freshest ingredients. We never use MSG or pork stock to season our vegetables, and only a few of our recipes use pork as an ingredient. Lunch and dinner are available all week at both locations and breakfast is served on Saturday and Sunday at the Kernersville location. Read more of our reviews on any of these sites! View our daily menus to check out what we are serving. We look forward to serving you breakfast, lunch and dinner!